Diabetic golfers are at high risk of developing nerve damage as well as poor circulation in the feet. Impaired circulation causes wounds on the feet to heal slower, which increases the risk of infection. Nerve damage can cause numbness in the feet, which means you might not be able to feel heat, cold, or pain in your feet. 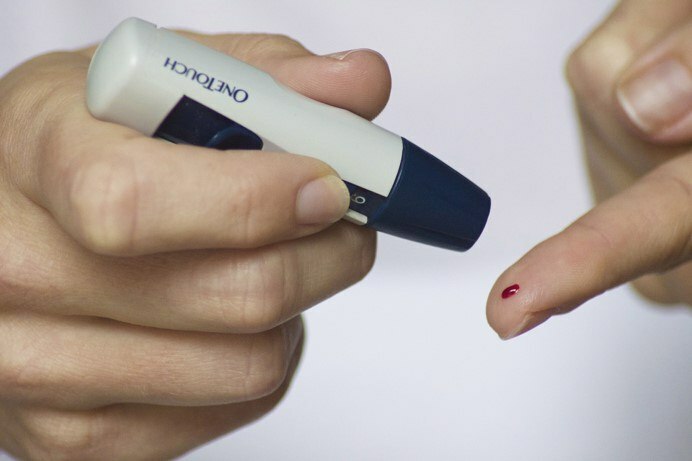 A golfer with diabetes and these complications might not notice that his shoes are rubbing or pinching his feet as well as not noticing when there are sharp objects inside the golf shoe such as stones or even a paperclip. That can wreak havoc on your feet over a 4 or 5 hour round. Impaired circulation and the damage to nerves when combined make feet more susceptible to foot ulcers. Bad-fitting shoes increase that risk exponentially from friction and rubbing, but finding the best golf shoes for diabetics is easier than ever with the new styles released by the top golf shoe manufacturers. Your feet will thank you and you'll be golfing for years to come. The Ecco Men's Cage golf shoe has a strong heel to provide support without rubbing and provides a lot of padding around the throat of the shoe. The BOA system to tighten and loosen the shoe makes it easy to adjust to your feet and the toe box is made of very soft breathable material to keep you dry. This is where your toes and ball of your foot go. The shoe should be long enough so the toes don't hit the front and have enough space for toes to wiggle and wide enough to not pinch the balls of the feet. Breathable material is preferred to keep your feet dry - perforated leather is good while cloth can be better as long as you're not playing in wet conditions. Sweat will evaporate and keep you drier. A nice soft toe box that won't rub and irritate your foot is a good idea. A drier foot is less likely to develop an ulcer or wound as you walk around the course. The tongue should be wide enough with enough padding so that the laces don’t dig into the top of your foot. Some shoes tongues have slits in the middle so you can thread the laces to hold the tongue in place. This will prevent it sliding around as you walk for hours on the course. This is the opening where you stick your foot into the shoe. The rim of the throat should be well padded and low enough so it doesn't rub your ankle bones where the skin is very thinly stretched making it more susceptible to friction injury. This is the area that cups your heel. A higher heel counter will provide more support and less rubbing as you walk. Shoes with a high heel counter have a notch for the Achilles tendon to avoid digging into it. This part of the shoe usually made of carbon rubber that comes into direct contact with the ground, so it must be long-lasting and flexible. Slip-on loafer style golf shoes are no good because there is very little of the shoe covering the top of the foot so they provide inadequate support. They're also often made of unpadded, rigid leather, which can be a source of friction. Golf sandals are unsuitable because the straps cause friction. Stud pressure from golf shoes can cause pain especially in the balls of the feet. 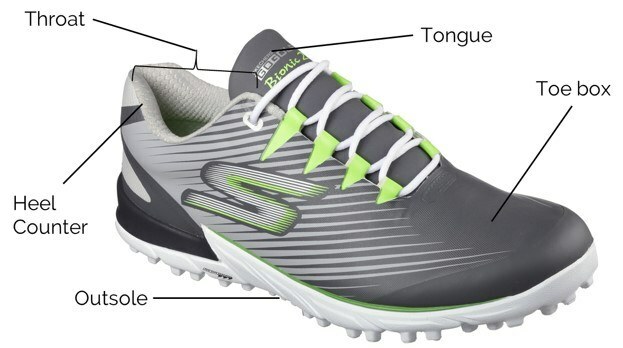 The new and increasingly popular spikeless golf shoe adds comfort to the walk and in my spikeless golf shoes, I can play 36 holes easily while traditional golf shoes with hard insole really hurt after 14 or 15 holes. Laces threaded through leather or fabric loops or punched-out holes have more give than through plastic or metal eyelets. We want some give so the shoe can morph to the shape of your foot as you walk out there on the course. Round laces stretch more than flat laces which can be beneficial for those long walks that you spoil with golf shots. Rigid and inflexible laces can crate pressure on your skin. A great solution by many manufacturers is to have a tightness adjuster on the tongue or heel of the golf shoe that you can turn like a wrench to tighten or loosen the shoes. They're convenient and make life very easy for a golfer with diabetes. The Ecco Pro Cage BOA has everything you could want to protect your feet. It's encased with a 'cage' that supports your foot from heel to toe. The laces are easy to adjust by turning the little knob on the top of the tongue to give you an even fit that you can adjust to perfection to prevent rubbing especially on the top of your foot. The throat is well padded with a high heel section but lower around the ankle. The spikeless design ensures none of that pesky stud pressure that can really hurt the balls of your feet at the end of the round. You do pay for the privilege though and these shoes, like all Ecco's are expensive. Very breathable upper with GoreTex incorporated into the shoe keeps your feet free from outside water and dries them from the inside with breathable material. 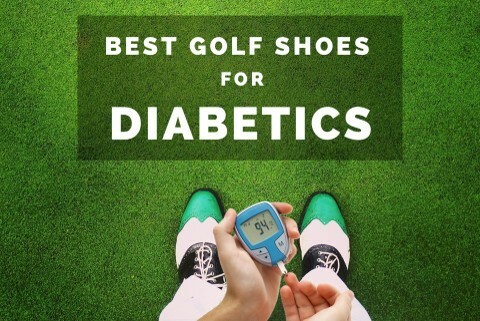 The best golf shoe for diabetics and with the soft insole it should be great out of the box, but you can also get yourself some orthotics to slip in for a more comfortable bottom. The Go Pro 2 from Skechers is used by everyone's favorite golfer, Matt Kuchar and it's easy to see why. Like their sneakers, Skechers has made a shoe that's very comfortable but also has a waterproof toe box to keep your feet nice and dry from outside water. The soft spikes are replaceable on the bottom of the shoes and provide excellent grip so you won't be slipping down slopes. Round laces mean that the shoes have more 'give' when you walk to flex with your foot and these laces thread through a slit in the tongue to keep that tongue in place, further helping to prevent rubbing. Padding in the throat combined with the high and firm heel support mean the shoe stays put, keeping your heel and Achilles unhindered. Adidas have made a very lightweight and well priced golf shoe in the Tech Response. The large amount of breathable material on the shoe means your feet can breathe and stay dry from your sweat. While the breathability and light weight is the upside, the downside is that the shoe will let moisture in from outside. For morning golfers, the dew might permeate in, but as the day dries up, the water will have an easy time evaporating, leaving you dry. Round laces threaded through punched-out holes and through a slit in the tongue means your shoe will move with your foot instead of being rigid with a lot of foot friction. Another downside is less padding in the throat but still a sufficient amount to feel like a decent tennis shoe. The high heel support and low ankle height of the throat make it really easy to wear with sturdy support for the back of your foot. The Tour360 Boost is a more 'traditional' looking shoe and less like the comfy trainer types you see which are made for comfort and a casual look. But make no mistake, these are excellent shoes with unique features for adding flexibility and comfort. The area under the middle of the shoe provides for more flexibility between the ball of your foot and the heel for better arch support. Above that area, around the middle of the foot is a 360Wrap which, when tightened, provides extra support and fit to the middle of your foot. The laces are flat and thread through eyelets but do thread through a slit in the tongue. The tongue will stay in place all round long. The eyelets may not be totally ideal, but with the extra tech under in the sole and the Wrap360 add that extra level of support. Special foam in the soles give you extra bounce and support for those long walks. A very good looking shoe that keeps the water out and aids in dispersing the sweat on the inside. Ecco have become famous for their comfortable golf shoes and were the footwear of choice for the two most chill PGA Tour pros, Ernie Els and Freddy Couples. The Biom model is the one you see them wearing as they glide the fairways of the Tour. With yak leather uppers, the Danish shoes are made to last and are breathable as well as water-resistant. The rounded laces thread nicely through a tongue slit for a stable fit and the throat is padded for comfort. You can imagine Ernie and Freddy wearing these to bed even. The spikeless shoes are comfortable for walking and with the reputation of Ecco, you can trust these will be comfortable right out the box and last you a very long time. The spikeless bottom is durable and there's no need to worry about the mini studs wearing out any time soon. You can buy a pair of shoes, send them back if they're the wrong size and get your perfect fit. Once you find that pair of shoes that keeps your feet feeling fresh all round long, you'll wonder why you didn't do it earlier. Imagine sitting int he clubhouse with no pain under your feet and ready to play another 18 holes. Those beaten up old 'classic', 'traditional' golf shoes aren't doing you any favors. Try a pair of Eccos and you might end up using Ecco for every shoe in your closet.